As I recounted in Part 1, the influence of Thérèse of Lisieux was due to the publication of her spiritual memoir Story of a Soul. Published in 1898, the year after Thérèse died from tuberculosis at the age of 24, Story of a Soul became a sensation. 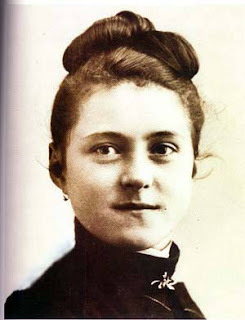 It led to worldwide devotion, with many Catholics praying to Thérèse. Miracles due to her intercession followed, leading to her sainthood in 1925. But it was the theological content of Story of a Soul, with its discussion of the spirituality of the Little Way (among other things), that led to Thérèse becoming a doctor of the church in 1997. What was in this memoir--Story of a Soul--that caused such a ruckus? In this post I want to give a brief history and overview of Story of a Soul. But I'd like to offer a warning before you rush off to buy a copy. While it is true that many have been profoundly affected by Story of a Soul it's also true that a lot of people don't like the book and can't see what all the fuss is about. My point is that it's possible that you could buy the book and fail to finish it. I myself struggled with it a great deal. At that time I did not comprehend that we are all "called to be saints," as St. Paul puts it. Most people nowadays, if they were asked, would say diffidently that they do not profess to be saints, indeed they do not want to be saints. And yet the saint is the holy man, the "whole man," the integrated man. We all wish to be that, but in these days of stress and strain we are not developing our spiritual capacities as we should and most of us will admit that. We want to grow in love but we do not know how. Love is a science, a knowledge, and we lack it. My confessor at the time was Father Zachary, an Augustinian Father of the Assumption, stationed at the Church of Our Lady of Guadalupe on West Fourteenth Street. He was preparing me for Confirmation, giving me weekly evening instruction. I dutifully read The Story of a Soul and am ashamed to confess that I found it colorless, monotonous, too small in fact for my notice. What kind of saint was this who felt that she had to practice heroic charity in eating what was put in front of her, in taking medicine, enduring cold and heat, restraint, enduring the society of mediocre souls, in following the strict regime of the convent of Carmelite nuns which she joined at the age of fifteen? ... I was reading in my Daily Missal of saints stretched on the rack, burnt by flames, starving themselves in the desert, and so on. Joan of Arc leading an army fitted more into my concept of a saint...I wondered what this new saint had to offer...it took me a long time to realize the unique position of Therese of Lisieux in the Church today. Though there are parts of her story that I find difficult to accept (her childhood religiosity can sound pretentious, precious, and even a little neurotic, and her efforts at self-denial sometimes are close to masochistic), and though it is embarrassing to admit that one of my favorite saints is one of the most girlish and cloying, it is finally the woman herself who appeals to me. Like every other saint, Thérèse Martin was a product of her times, raised in the overheated environment of a super-religious family and formed in the pious nineteenth-century French convent life. So it is hardly surprising that some of her words and actions occasionally baffle us. But shining through the nineteenth-century piety, like a pale green shoot bursting through dark soil, is a stunningly original personality, a person who, despite the difficulties of life, holds out to us her Little Way and says to us one thing: Love. Is the atom a small thing? And yet what havoc it has wrought. Is her little way a small contribution to the life of the Spirit? It has all the power of the Spirit of Christianity behind it. It has an explosive force that can transform our lives and the life of the world, once put into effect. The point being, even great admirers of Thérèse have struggled with their initial encounter with Story of a Soul, both its style and its message. For my part, being a rationalistic and practical sort of person, I struggled with all the mystical flights that fill Story of a Soul. When love-drunk contemplatives wax on about their mystical and rapturous unions with God I tend to roll my eyes. I can handle a few lines of the stuff. But Story of a Soul has pages and pages of it. So reader be warned. Story of a Soul might not be your cup of tea. That said, the spirituality of the Little Way is too important to miss. Thus this series! Aren't you glad you're here? This is my attempt to extract and summarize the Little Way from the Story of a Soul so that it can get a wider hearing. A brief overview of the history, structure and content of Story of a Soul. Recall, Thérèse was at Carmel with her two older sisters, Pauline (who was the Prioress) and Marie. One day the sisters were talking and reminiscing about their family and childhood. Wanting to capture this and capitalizing on Thérèse's writing ability Pauline, as Prioress, "ordered" Thérèse to write about the family and her earliest memories. Thérèse dutifully did so, writing an autobiographical memoir spanning her earliest recollections to the time of her entrance into Carmel at the age of fifteen. The manuscript was written for her sisters as a family keepsake. It is love alone that attracts me. Jesus has no need of books or teachers to instruct souls; He teaches without the noise of words. I applied myself to practicing little virtues, not having the capability of practicing the great. Because I was little and weak He lowered Himself to me, and he instructed me secretly in the things of His love. God made me feel that true glory is that which will last eternally, and to reach it, it isn't necessary to perform striking works but to hide oneself and practice virtue in such a way that the left hand knows not what the right hand is doing. I expect that Manuscript A will be hardest part of Story of a Soul to get through. It was for me. Plus, its the bulk of the book. Recall, in April of 1896 Thérèse woke up in the middle of the night with blood in her mouth. Fearing that her younger sister would die before she could share her approach to the spiritual life Marie asked Thérèse to write down "her little doctrine." Manuscript B is short, about 24 pages. It is the mystical heart of the Little Way. It's not very practical, but it's the spiritual core. Many consider it to be one of the crown jewels of the mystical tradition. I understood that LOVE COMPRISED ALL VOCATIONS, THAT LOVE WAS EVERYTHING, THAT IT EMBRACED ALL TIMES AND PLACES...IN A WORD, THAT IT WAS ETERNAL! Story of a Soul introduced that idea to the world. As Thérèse neared death Pauline began to regret that she had only ordered Thérèse to write about early family memories (Manuscript A). She wished that she had ordered Thérèse to share more of her religious life, particularly as it developed over her nine years at Carmel. Recall, Manuscript A ends with a 15-year-old Thérèse entering the monastery. Trouble was, Pauline was no longer Prioress and couldn't order Thérèse to write more. (Why not simply ask your sister to write some more? Because of the monastic call to humility. Thérèse would only write about herself when ordered to.) To get around this, Pauline convinced Mother Marie, the sister who succeeded her as Prioress, to order Thérèse to write about her religious life at Carmel. Thérèse duly wrote two long chapters--Manuscript C--but died before it was finished. Charity consists in bearing with the faults of others, in not being surprised by their weakness. [When] the devil tries to place before the eyes of my soul the faults of such and such a Sister who is less attractive to me, I hasten to search out her virtues, her good intentions. I want to be charitable in my thoughts toward others at all times. I wasn't content simply with praying very much for [this "very disagreeable"] Sister who gave me so many struggles, but I took care to render her all the services possible, and when I was tempted to answer her back in a disagreeable manner, I was content with giving her my most friendly smile, and with a changing of the subject of the conversation. I told myself that charity must not consist in feelings but in works. In the posts to come I'll share more quotes and reflections from both Manuscript B and Manuscript C (with bits of A thrown in)--the mystical and practical manifestos of the Little Way. Until then, may we all strive to become the heart of the church. "I shall be love. Thus I shall be everything." I'm working with the critical edition by John Clarke (http://www.amazon.com/Story-Soul-Autobiography-Therese-Lisieux/dp/0935216588/ref=sr_1_1?ie=UTF8&qid=1325957767&sr=8-1) where the various manuscripts are labeled A, B, C. Earlier versions of Story of a Soul didn't delineate the parts as such, as Pauline edited her sister's manuscripts into a whole. But based on the version I have, it looks like Manuscript B starts with Chapter IX "My Vocation is Love." Manuscript C is Chapters X and XI, "The Trial of Faith" and "Those You Have Given Me." This morning I watched a movie about her, titled "Therese". It was apparently one of the offerings at the 2002 Cannes Film Festival, where it won some awards. The movie is done in kind of a stark way with minimal props and set. Just from the movie, it strikes me that as a young girl, she had very romantic notions of a religous nature. But she ended up in kind of a "dark night of the soul." And even in what is supposed to be a very devoted-to-Christ environment, social politics ran the show. Her dark night of the soul is another reason I'm interested in Thérèse. At the end of my posts about the Little Way I'm going to end with an "epilogue" about her dark night. I look forward to your epilogue about her dark night. I think such a dark night is inevitable, and those riding the surf in their certainty probably never see it coming. I can also see how her story is relevant to us today. She seemed to romanticize monastic life for its spiritual importance, the way many young adult Christians may romanticize vocational "ministry." Once she got there, however, it was more a matter of very ordinary tasks (such as laundry), meted out in a constricting rules-bound environment, rules that were also romanticized, but seemed to me to be merely control for control's sake. As she gets to know the other women, she discovers they have secrets, little ways of breaking the rules. An elderly nun has a forbidden picture of her deceased husband. Another has all but lost her faith, and feels herself imprisoned. But their friendship is interrupted, and they are forbidden to spend time together by the woman in charge. Typical use of power, in my view. But unravaling that romantized notion of "ministry" and "doing big things for God" seems to me the best thing about her story. Making a difference is personal, not grandiose. I found you through FB - where I spend way too much time. I grew up Catholic, in the moderno seventies when not a lot of emphasis was put on the saints - or Mary, for that matter. Thank goodness for my Great Aunt and her travels to places Mary had appeared: Fatima and Lourdes were the ones I mostly learned from her. But I couldn't put Mary in context and I couldn't put the saints in context. I just figured my Catholic faith had its eccentricities. I eventually was able to put everything "in context" and love and embrace what those "eccentricities" represent for me as a Catholic today. Anyway. I'm so glad to have the opportunity to learn about St. Therese here. Her "little way" is something I need to think more about as I consider my place in the world today and how my faith can be better expressed every day. I expect I will read and re-read your essays. Thanks for doing this important work. i really appreciate all the work your poured into doing this. well written. Manuscript A to me explains her drive to help others. It is the foundation of family life and it's influence on her that she describes. How love is modeled matters. She was a spiritual psychologist. She understood that little children needed proper formation and guidance...it starts in the home. She learned in her childhood to put others before herself...her Christmas miracle. She became selfless. She understood that not all children receive this blessing and therefore planted her desire to help SAVE SOULS.